When he announced his plan, he acted as if the rationale were so obvious that any 6-year-old would get it. If that's true, maybe adults should be worried. Of all Donald Trump’s departures from tradition, none holds such potentially grave consequences as his decision to build up U.S. nuclear weapons. 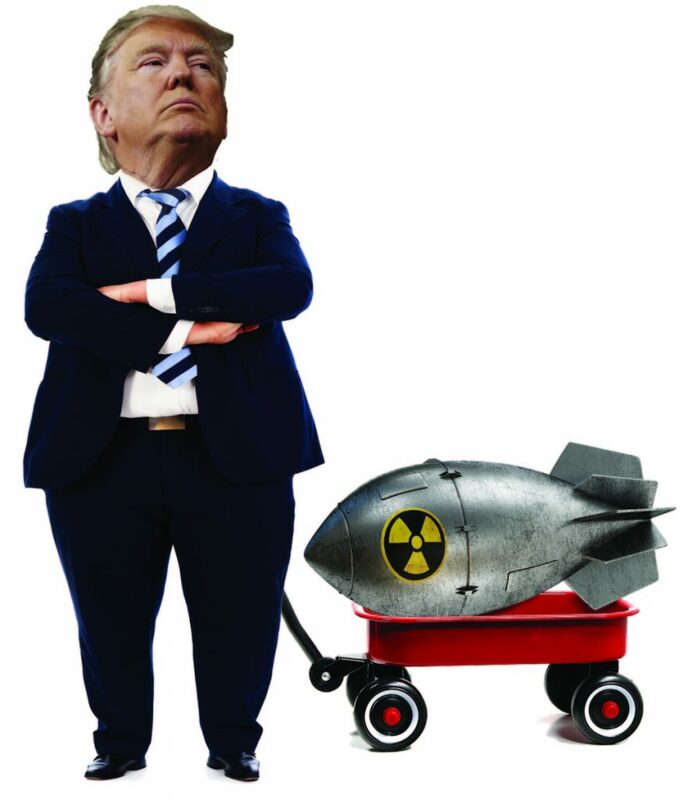 After a decadeslong trend toward disarmament, Trump’s estimated $1.2 trillion-dollar upgrade would not only make current nuclear bombs more lethal but would add new long-range missiles to the U.S. arsenal. When Trump announced his plan for nuclear weapons “modernization” in his State of the Union address, he acted as if the rationale were so obvious that any 6-year-old would get it. Perhaps he’s right, in that 6-year-olds might think that the side with the biggest, deadliest bombs wins. But while that may have been true of warfare in the past, most grown-ups who’ve given the issue thought – physicists, arms-control experts, and several former war planners – know that the nuclear age is different. Faye Flam is a Bloomberg View columnist. She has a degree in geophysics from the California Institute of Technology, and has been a Knight-Wallace fellow at the University of Michigan. The rules of the game of war suddenly changed in the mid-20th century, when the U.S. and the USSR both acquired the ability to instantly destroy the world hundreds of times over. At that point, survival and security became less a matter of technology and more one of psychology. The ostensible reason the U.S. continues to keep nuclear weapons is to deter other nuclear states from using theirs. But again, what difference do Russia’s advances make when the U.S. already has the ability to exterminate the human race in the most agonizing imaginable way? The argument for more nukes looks suspiciously similar to the again-popular conservative idea that the best way to fight gun violence is with more guns. And how do we know if America’s nuclear adversaries will be deterred more by the U.S. continuing to disarm, or by starting a “new arms race,” as the New York Times described the Trump administration’s position? I posed that question to Gen. George Lee Butler, who during the 1980s and early 1990s was commander in chief of the Strategic Air Command, and later, the United States Strategic Command – the major U.S. deterrence forces. Butler, who recounts his Cold-Warrior life in a recent two-volume memoir, said that in seeking deterrence, U.S. nuclear war planners focused on what they thought was most precious to the Soviet leadership: their survival. Thus it was that at one point, the U.S. aimed 400 nuclear weapons at Moscow alone – each many times more powerful than those dropped on Hiroshima and Nagasaki. The goal, he said, was, in the case of a retaliatory strike, 100 percent assurance that the Soviet government would be destroyed in its entirety. He came to realize, he said, that while deterrence was the ostensible point of such preparations, it’s a concept “ill-suited” to nuclear policy and strategy. “Nuclear deterrence assumes that you have a deep understanding of your foe’s capability and likely reactions under different circumstances,” he said. As I listened, I came to understand that nuclear deterrence is a thin safety net made of guesswork and assumptions. If the goal of Trump’s modernization is deterrence, then there’s concern it will backfire. If the goal is something else – such as actually using nuclear weapons in warfare – then the Trump administration is proposing a moral and ethical departure that Americans need to talk about. Another Cold War insider turned deterrence skeptic is Daniel Ellsberg, a former Rand corporation strategist (and later leaker of the Pentagon Papers) and author of the recent book “The Doomsday Machine: Confessions of a Nuclear War Planner.” In a conversation with him last year, he said he changed his mind about the value of retaliating after a perceived nuclear attack when he recognized the potential for nuclear war to cause a global environmental catastrophe known as nuclear winter. Under those circumstances, using even a fraction of the Russian or U.S. arsenal would amount to a suicide bombing. Both Butler and Ellsberg said they worried about the prospect of starting a nuclear war by mistake. There have been a number of risky incidents, the most notable being the Cuban Missile Crisis, when commanders aboard a Soviet submarine thought nuclear war had begun and almost fired a nuclear missile. Butler said he became well acquainted with the risk of accidental nuclear war while acting as principal nuclear adviser to the senior Bush and Clinton administrations. In exercises, the president would get about 10 minutes to decide whether to launch a retaliatory strike. The world so far has been spared by psychology – by the behavior of people on the other side and their assumptions about what U.S. leaders would or would not do. The benefits of Trump’s nuclear arms modernization are not obvious. We can’t afford to assume his administration is taking the best possible course of action to protect us. We have to keep asking questions. The stakes couldn’t be higher.